Kingston, Jamaica will be the hub of attention for the international communications sector when it hosts two major conferences of public interest media and journalists in August 2018. The Public Media Alliance (formerly the Commonwealth Broadcasting Association) will hold its biennial global conference on August 13, at the Jamaica Pegasus under the theme, Speak Out: Rebuilding Trust in Media and Democracy. 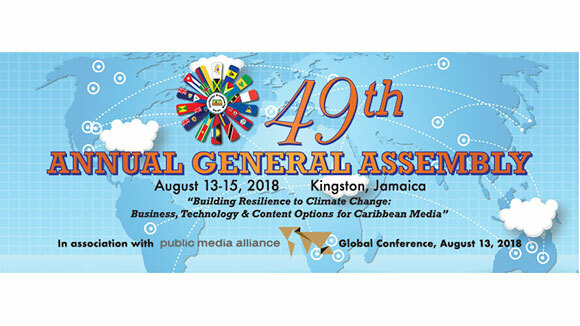 And the Caribbean Broadcasting Union’s 49th Annual General Assembly takes place the following day, August 14, focussing on Building Resilience to Climate Change: Business, Technology and Content Options for Caribbean Media. Prime Minister of Jamaica, Most Hon. Andrew Holness ON MP will be the feature speaker at the official opening ceremony on the evening of August 13, while Minister responsible for Information, Sen the Hon. Dr. Ruel Reid will provide the key note address during the CBU conference day on August 14. The consecutive events will be attended by executives from major media houses including Fran Unsworth, Head of News for the BBC, Paul Thompson, CEO of Radio New Zealand and Director General of the African Broadcasting Union, Gregoire Ndjaka. The PMA Global Conference will include a session dedicated to UK and Caribbean news coverage of the plight of the “Windrush” children, many of whom had lost access to rights and benefits, including the opportunity to return to the UK, until media reports forced a change of policy by the British government. While in the wake of the catastrophic hurricanes that devastated countries and territories across the Caribbean in September 2017, the CBU will partner with the CARICOM Climate Change Centre to spotlight strategies and resources for ensuring the resilience of the region’s media sector. Participating delegates have been invited to attend a showcase of Jamaican screen productions hosted by JAMPRO. The event will highlight Jamaican TV and film productions to the Caribbean and international delegates from the CBU and PMA. The feature speaker at the screening will be Louis Hillelson, Vice President of Sales for Reed MIDEM, organisers of MIPCOM and MIP TV, two of the largest global market-places for media content, held annually in France. And the best of the media offerings from the region will be celebrated at the Caribbean Broadcasting Awards gala, on the evening of Tuesday, August 14, at the Courtleigh Auditorium, to be addressed by Jamaica’s Minister of Tourism, the Hon. Edmund Bartlett. The international media practitioners will have an opportunity to learn more of the culture and beauty of the island, on a tour to top attractions in St Ann, hosted by the Jamaica Tourist Board.